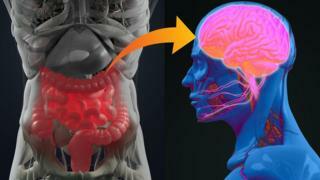 The brain disease Parkinson's may actually start in the depths of the digestive system, US scientists say. In their study, people whose appendix had been removed were less likely to develop the neurodegenerative disease. And the appendix, long thought of as pointless in the human body, contained the substance that kills brain cells. Parkinson's UK said the findings were the most compelling evidence yet that the disease's origins lie outside the brain. It might feel counter-intuitive, but there is now growing evidence that the gut is involved. Researchers at the Van Andel Research Institute, in Michigan, looked at data on 1.7 million people over half a century. The study, published in Science Translational Medicine, showed the risk of Parkinson's was 20% lower in the people who had had their appendix removed. The appendix is a little sac at the opening of the large intestine and is probably the best known vestigial (without a use) organ in the human body. And analysing the content of people's appendixes showed they contained the same toxic protein - called alpha synuclein - that is found in the brains of Parkinson's patients. The appendix is clearly not the whole of the story (otherwise removing it would prevent all cases). One of the researchers, Dr Viviane Labrie, said people should not rush to have their appendix removed. She said: "We're not advocating appendectomy as a form of protecting against Parkinson's disease. "It would be much more wise to control or dampen excessive formation of alpha synuclein to tune down the overabundance or potentially to prevent its escape." Patients often report digestive disorders. Cutting the vagus nerve is linked to a lower level of Parkinson's and animal studies have suggested bacteria that live in the gut are key. Claire Bale, from Parkinson's UK, said: "This research is really important because it gives us some of the most compelling evidence yet that Parkinson's may begin outside the brain, which is a revolutionary new idea that is emerging in the scientific world. "Understanding where and how Parkinson's begins will be absolutely crucial to developing treatments that can stop it and potential prevent it altogether." The study showed nearly everybody tested had alpha-synuclein protein in their appendix. And there were some differences in the structure of the protein between healthy people and Parkinson's patients. However, the hunt for the origins of Parkinson's still cannot explain why the disease develops in some people but not others.